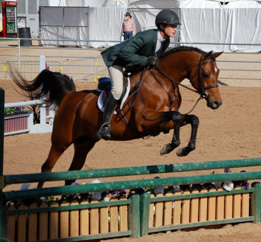 Soleil CA soaring at Scottsdale with Kristin. It takes a leap of faith and a strong belief in your horse when you pick Scottsdale for your stallion's first jumping show. Breeder-owner Cambria DeMarco has that faith in Khemosabi++++// grandson, Soleil CA (Showgun PGN++// x Khameo AA). It turns out, she was right to believe in him. He was not at all intimidated by the lofty reputation of the show, and instead won almost everything he entered handily. These wins included High Point Championship in Green Working Hunter, and the Sport Horse Under Saddle Junior Championship. In Hunter Hack, he came out first in a class so deep with talent, it included horses with Legion of Merit awards and a USEF Horse of the Year. Soleil shows perfect form with Britt. Cambria reflects on Soleil's accomplishments that it "Sounds like something the amazing and wonderful Khemosabi would have done. Maybe Soleil was doing it for his Grandpa!" 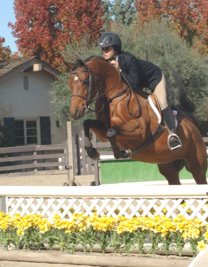 In addition, he's won Green Working Hunter Over Fences, Working Hunter Under Saddle, and many Sport Horse In-Hand classes. Soleil was also the 2008 SHN two-year old Jackpot Winner—proof that SHN Payback youngsters can continue their winning ways. The luminously beautiful Khameo AA. 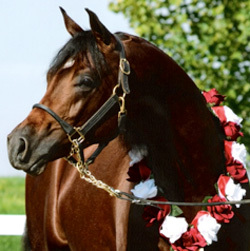 What does Cambria credit for such a young stallion having accomplished so much? First of all, it helps if you start with a wonderful mare like the luminescent Khameo AA as the dam. "Both Soleil and Khameo have their Grandpa's love of competition," she explains. "They know when they are showing and they put on that extra flair. They are both also blessed with the Khemosabi temperament. They love their people and are very social." Khameo herself has wins in everything from Most Classic Head to Sport Horse In-Hand, to Dressage, enabling her to imbue her son, Soleil with that Khemo versatility. Soleil with his Sport Horse Nationals necklace. 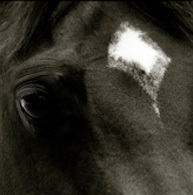 2011 marks Soleil's first year offered at stud, and he has no foals on the ground yet. This gives mare owners an opportunity to get in on the ground floor with a rising young star that has an even brighter future. Cambria believes he will make a fine sire. Soleil is very protective of his herd and people, and has Khemosabi's courage. She relates, "Just last week he warned us about a rattle snake that was lurking outside the barn door!" Cambria expresses a sentiment common to Khemosabi owners everywhere, "I love my Khemo khids and Khemo Grandkhid too!"